The U.S. Navy is preparing to wage cyber warfare attacks against enemies during conflicts and must avoid strategic surprise from a future cyber attack on its networks, according to a strategy report made public Wednesday night. "The opening salvos of the next war will likely occur in cyberspace and the Navy must be ready," the report said. "We must organize, train, and resource a credible workforce of cyber professionals and develop forward-leaning, interoperable, and resilient cyberspace capabilities to successfully counter and defeat a determined adversary in cyberspace." The report, "Navy Cyber Power 2020," outlines the Navy’s plans to defend against cyber attacks and to conduct cyber warfare and other operations in future conflicts. Threat of cyber attack comes from nations, terrorists, and hackers. Among the threats are jamming of communications of weapons systems and aircraft; denial of network communications; disruptive internal penetrations of computer networks; and attacks on critical infrastructure, according to the report. Computer networks and the information they provide are key advantages that "enabled the Navy to act with speed, agility, and precision in a broad spectrum of operations ranging from humanitarian assistance to major combat operations," the report said. However, these advantages could become vulnerabilities if the Navy is prevented from fighting effectively due to cyber attacks. "Practically all major systems on ships, aircraft, submarines, and unmanned vehicles are networked to some degree," the report said. These systems include most combat, communications, engineering, and position, navigation, and timing (PNT) systems used in precision guided missile and bomb attacks. Key objectives for the coming decade will be to make sure cyberspace can be used for critical mission functions and to command and control forces. To prevent "strategic surprise in cyberspace" the Navy will also monitor adversary actions in cyberspace through intelligence operations and analysis. Additionally, the Navy "delivers cyber effects at a time and place of its choosing across the full range of military operations in support of commanders’ objectives," the report said. 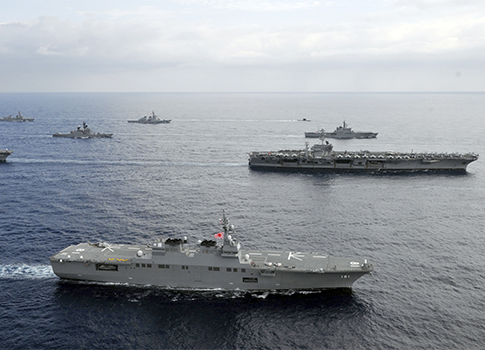 Cyber attacks by foreign governments and non-state adversaries can "hold Navy forces at risk." "Over the past several years Navy networks have been attacked in cyberspace by a broad array of state actors, terrorist organizations, ‘hacktivist’ groups, organized crime, and individual hackers," the report said. "Motivations include personal gain, information theft, discrediting the United States, sabotage, political gain, denial or degradation of the Navy’s access to cyberspace, and mapping Navy networks." The attacks led to diminishing the Navy’s advantage over adversaries, security compromises, and personnel stress. The major danger was described as "Advanced Persistent Threats" posed by foreign governments and non-state actors that can "relentlessly probe and attack our networks as part of a larger Anti-Access/Area Denial (A2/AD) strategy." The anti-access and area denial forces are often used by the Pentagon as code for threats posed by China’s cyber warfare capabilities and high-technology weapons, such as anti-ship ballistic missiles, anti-satellite missiles, and submarines. The Navy will counter those threats through both defensive and offensive efforts, the report said. "Our success in the maritime domain depends upon our ability to project power and prevail in cyberspace," the report said. The Navy also outlined its plans for "information dominance" in a separate report released Wednesday night. It states that adversaries are using advanced technology to exploit "seams" in military networks; disrupt Navy dependence on over-the-horizon intelligence, communications, and combat systems; and spy on Navy ship and aircraft movements. This report said the Navy will boost its lethal and non-lethal electronic warfare capabilities. The first report also warned about threats to information technology supply chains. For example, hardware and software that has been produced overseas, especially in Asia, could be compromised. U.S. officials have said advanced aircraft and other weapons systems contain Chinese-made microchips that could contain hard-to-detect digital openings in computer chips that could be accessed remotely by China to disable weapons systems during wartime. "Each node within the global IT supply chain presents adversaries with an opportunity to introduce a cyber threat or exploit the system for their own purposes," the report said. "Our acquisition system must have greater visibility and more effective controls across the entire supply chain supporting Navy needs." This entry was posted in National Security and tagged China, Cyber Security, Navy. Bookmark the permalink.